The goal of Centre Foundry & Machine Company is to provide heavy section iron castings that meet the customer’s specifications and industry standards, on time, with continuously improving quality, and most importantly maintaining the upmost safety for our employees. Centre Foundry & Machine Company has a wide variety of patterns. Each product of Centre Foundry is custom to our customer’s specifications, and it is essential for us to maintain a meticulous control throughout our production processes. A complete set of all product prints are maintained in the Engineering Department. In addition, work-in-progress prints are maintained in a Quality Control data base so that all facets of productions are equipped efficiently with a ready source of blueprint information. To assure that correct chemistry and product properties are achieved, scrap is purchased through certified scrap dealers. Scrap handling employees are trained to recognize and set aside deleterious raw materials. Chemistries of Ferro-alloys are attached with shipment and are inspected to conformance by melting supervisor to control the metallurgical properties of our castings. 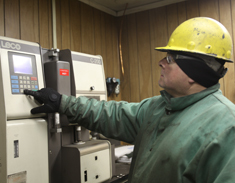 Centre Foundry & Machine Company has a complete laboratory for analysis on sand and metal. A sample is taken from each individual ladle. These samples represent the final adjusted chemistry and are stored for future use and comparison. We are equipped with an on-site spectrometer and LECO C-200 carbon analyzer.